In December 1970 Roger and Carolyn Perron purchased a farmhouse in Harrisville, Rhode Island. Following events at their previous address, Carolyn decided she did not want to rear her children there and felt a house in the country would be a more suitable location for her 5 young girls to grow up. What Carolyn thought would be her dream home turned into a living nightmare. Seeking to move the children to a quieter home life in the country, Roger and Carolyn Perron purchased their dream home in the winter of 1970. The Old Arnold Estate was 200 acres in size and one of the original plantations in the area surveyed by colonist John Smith in 1680 and deeded to Roger Williams for the formation of the state of Rhode Island. Located on Round Top Road in Harrisville, Rhode Island, the 10-room “lovely, charming” country home was built in 1736 on a beautiful plot of land with plenty of room for their five children, all girls, to roam about and play. Nancy and Christine Perron shared one room, Cindy and April another, and Andrea had a room all to herself – except on nights when, as Andrea put it, the sisters “came crawling into bed with her, trembling and crying in terror”. The house they purchased was the old Arnold farm which was over two centuries old. Eight generations of families had lived and died in that house and some of these spirits never left. Previous residents of the farmhouse included Mrs John Arnold who at the age of 93 hung herself in the barn and Bathsheba Sherman who had an extremely hard life. She lost all of her children before the age of four. When she was a young woman, Bathsheba had a young child in her care (it is uncertain if this was her child or if she was caring for the child for a friend) that died. Upon examination of the baby’s body it was found that a needle had been impaled into its skull and the baby had died from convulsions. Bathsheba was charged with manslaughter but due to lack of evidence the case was dropped. However, in the court of public opinion she was found guilty. She was a very beautiful woman whom men loved and women envied. Following the death of the baby rumours began to swirl that Bathsheba had sacrificed this baby as an offering to the devil for eternal beauty. Due to the belief of the locals that she was a witch she lived a life of solitude. Eventually she married and it is unsure if she lived all her days at the Arnold farm or the adjacent Sherman farm. She died in 1885 and the coroner made a note in his report stating that he had never seen anything like it that it was like her body had turned to stone. The Perron family spoke to a man who knew Bathsheba and he said she was a very angry and bitter woman who would beat and starve her farmhands. From the very first day the Perron family moved into the farmhouse the paranormal activity began. When the family first arrived at the house the old tenants were packing up the last of their things. As they did so a man stood in the corner watching them. Three of the five girls seen this man but the parents did not. It was an apparition. The family continued to see spirits some of which did not even notice the family were there, they were the quiet ones who lived peacefully at the farmhouse and did not bother the family. One of the girls made friends with a spirit whom she called Manny. He was a sympathetic soul whom the Perrons believed was the spirit of Johnny Arnold who had committed suicide in the house in the 1700’s. He would watch over the family. He would appear to the children but as soon as they made eye contact he would disappear. Many peaceful souls resided at the farmhouse but there was also dark forces. Every time the father was home machinery in the house began to breakdown that he would have to go and fix. All of this machinery was located in the cellar for example the boiler and the heating. When he would go to the cellar he would be approached by a spirit who seemed very attracted to him. She would touch him on the back of the neck and run her hands across his back. Over time he developed a kinship with this spirit and this was the spirit who caused most of the problems in the house. It is believed this was Bathsheba (although it is possible it could have been one of the many other spirits) and that she seen herself as the mistress of the house and Roger and the kids were hers which led her to put Carolyn Perron through what her daughter Andrea describes as ‘Something no human being should endure’. She wanted to drive Carolyn from the house and when this did not work she tried to claim her from within and this is when the true terror of Harrisville began. One of the children, Cindy, one day decided with her friend that they would try to drive the spirits from the house which resulted in a brutal attack on the two children and then Cindy began to suffer at the hands of the evil spirits also. At first the ghosts, or demon spirits were harmless. Described variously as opaque or somewhat solid in appearance, there were many spirits present in the old homestead. One ghost smelled of flowers while another would gently kiss the girls goodnight in their beds every night. Another appeared to be a small, young male that the girls would watch, mesmerized, push toy cars about the room propelled by an invisible hand. One apparition, presumably a female ghost, was a welcome presence in the home. The Perron’s would often hear sweeping noises coming from the kitchen. When they entered the room, they would find the broom had been moved to a different spot in the room with a neat pile of newly swept dirt sitting in the middle of the floor, waiting to be deposited in the trashcan. “Manny” was another spirit that the young Perron children loved. Manny was believed to be the spirit of Johnny Arnold, who had committed suicide by hanging himself in the attic of the house in the 1700’s. Manny would appear before the children, often standing nearby quietly watching the children going about their daily activities, a crooked smile on his face, amused at the children’s’ play. If eye contact was made with Manny, he would withdraw from sight just as suddenly as he had appeared. In addition to ghostly entities, the Perrons’ witnessed many other odd and unexplained phenomena. Beds would levitate several inches off of the floor, telephone handsets would hover in the air and slam down onto the phone base when someone entered the room, and various household objects would glide about the house on their own. Often chairs would be pulled suddenly from beneath an unsuspecting guest and pictures would tumble from the walls. The Perrons’ once reported seeing an orange ooze blood and a wall dissolve into nothingness. Not all the ghosts at Harrisville were welcome visitors. Some would yank the girls’ legs and hair during the middle of the night. Others would loudly bang the front door of the home with such force that the entire house would shake. Doors would slam shut on their own while others would stay frozen in place, unable to be shut no matter how much force was applied to them. One entity in the home routinely kept the family awake as it continually cried out in the night, “Mama! Maaaama!” while another apparition tortured 8-year-old Cindy telling her over and over, “there are seven dead soldiers buried in the wall”. One of the Perron’s recalled a small, delicate spirit, appearing to be about 4 years old, roaming the house crying, calling for her mother. The most horrid ghost in the home targeted Mrs. Perron specifically. 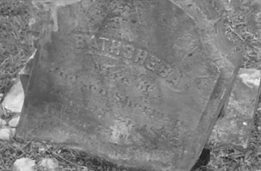 Known as Bathsheba, the entity was thought to have been the ghost of Bathsheba Sherman, a practicing Satanist and witch who had lived in the home in the early 19th century and died there after hanging herself from a tree behind the barn. The Perrons’ were not a religious family. Weak in faith, it was theorized to be a primary factor for the particularly violent and active nature of Bathsheba’s treatment of the Perron family. Bathsheba was a vile, hideous creature described as having a face “similar to a desiccated bee hive” covered in cobwebs with no real human features other than vermin crawling from crevices etched into the wrinkled skin of her face. Her head, round and gray, sat “leaning off to one side” as if her neck had been broken and an evil stench permeated the room when she was present. Bathsheba Thayer was born in 1812 in Rhode Island and married fellow Rhode Islander Judson Sherman on March 10, 1844. When alive Bathsheba had lived a life of solitude, an outcast of the community she lived in after being accused of killing her young baby as a sacrifice to Satan. The baby’s body was found to have been impaled in the head with a sharp object. Lacking evidence, the case was eventually dropped. Bathsheba was believed to have had three other children, none of whom survived past the age of four. Her children may not have been her only victims. Bathsheba was also known to have brutalized the staff often starving and beating them for minor infractions. When Bathsheba died on May 25, 1885, the coroner wrote that he had never seen anything like it – her emaciated body had eerily solidified, seemingly turned to stone. It was easily recognized that Bathsheba had her favorites in the household. She tortured Carolyn Perron (one of the daughters, Cindy, was often a frequent target) while lusting after Mr. Perron. During their stay, equipment in the home frequently broke. Roger Perron would take the broken machinery down to the cellar to repair. While working, he often felt Bathsheba touching him, gently caressing his neck or running her hands down his back. But while longing for Mr. Perron, Bathsheba abhorred Carolyn. It was clear that Bathsheba wanted Carolyn out of the house. In the beginning, Bathsheba’s treatment of Carolyn was merely “cruel”. Carolyn would be pinched, slapped, or have objects thrown about her. Her greatest fear, fire, was soon discovered by the entity and used repeatedly to strike terror in her as Bathsheba banged torches against her bed while demanding that she leave the home immediately. As time progressed, the attacks grew harsher. In one instance, Carolyn was lying on the couch when she felt a sharp pain in the calf of her leg. She examined her leg and found a large, bleeding puncture wound that looked “as if a large sewing needle had impaled her skin”. Later, after threats failed to motivate Carolyn to leave, Bathsheba took a different tack and attempted to invade Carolyn from within. 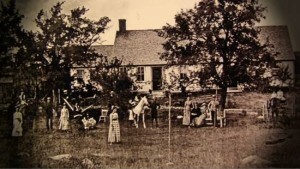 The Perrons’ soon learned that every occupant (with the exception of a local minister and his family) of the old Arnold Estate had reported supernatural phenomena on the homestead. In fact, the owner just prior to the Perrons’ had hired a contractor to renovate the house. The contractor had been busily renovating the home when he suddenly stopped work and fled. It was reported that he had left the home screaming leaving behind his tools and his car. The owners never moved in and the home sat vacant for several years before the Perrons’ discovered it was on the market. Despite their unfortunate circumstances, financial constraints kept the Perrons’ rooted in place for 10 long years. Unable to flee, they endured the inconvenience of the “friendly” spirits and the torture the malevolent ghosts bestowed upon them. Finally, in 1980, at the insistence of Carolyn, the Perrons’ were financially able to vacate the home. They moved to Georgia. Andrea Perron wrote a trilogy of books entitled ‘House of Darkness, House of Light’ volumes 1, 2 and 3 of their experiences in the home, She tours the country giving lectures and recollections of her time in the haunted home. According to Andrea Perron, the current owner, Norma Sutcliffe, who purchased the home in 1983, stated that she, her husband Gerry, and various visitors to the home have had paranormal experiences in the farmhouse, including the door banging in the front hall, sounds of people talking in another room, the sounds of footsteps scurrying around the house, and one odd instance when her husband’s chair began vibrating in the study room. They claim to have also witnessed a glowing blue light “shoot across the bedroom”, “fog” floating through the rooms of the home, and vibrations in the walls so intense they felt the house was going to come apart. Several visitors to their home have independently reported seeing an elderly woman, hair in a bun, moving silently throughout the house. the current residents claim there is always activity in the house but not to the extent the Perrons endured.